If you crank the “Photos” setting to the top, the next time one of your friends uploads a new photo album, there’s a good chance that you’ll see it in your News Feed. Similarly, if you drag the “Groups” setting to the very bottom, we’ll try not to show you any stories about friends joining or leaving groups (unless there’s just nothing else going on). 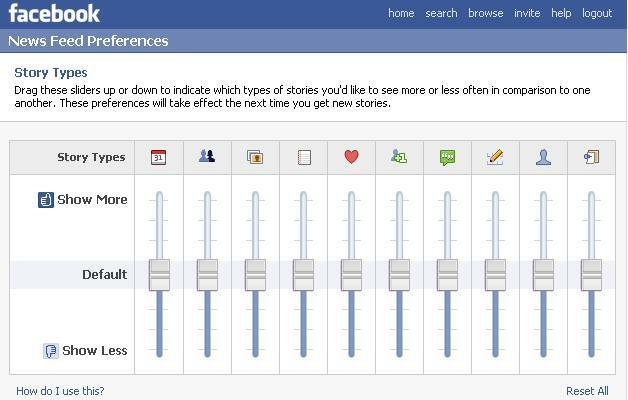 If you leave all of the settings around the middle, then you’ll continue to get a variety of stories like you do today. You can also add friends to a "More about These Friends" list, and you'll see their stories showing up more frequently on your feed. I think these are very user-friendly improvements, allowing users to custom-tailor their feeds. Certainly, if you have a lot of friends, using these two new features in conjunction will help filter out a lot of "noise".